Each Frame is .1 seconds apart. Larsen Jensen's time for the 1500 m race was 14:56.71, an American record. Frame #1: The right hand is about to enter. The left arm is well forward beginning propulsion as it abducts at the shoulder and flexes at the elbow. The minor amount of medial rotation of the upper arm sets this action apart from the great Australian distance swimmers. A slight amount of turbulence is coming of the left arm. The force created at this stage by the left arm has a large vertical component and a smaller horizontal component. The arm positions relative to each other indicate an "catch-up" stroke. The left leg kicks to counterbalance the entering right arm. However, the kick is big causing the knee to drop down, which momentarily increases frontal resistance. Frame #2: The right hand extends forward just below the surface. The left hand continues to abduct with the hand-forearm propelling surface gradually approaching vertical. The hand has swept outward in a manner that follows the flawed theory of an S-shaped pulling path for the freestyle hand. The shoulders are flat. Frame #3: The right arm continues in its extended forward position just below the surface. The left pulling arm is sweeping inward at the stage where abduction of the upper arm turns into adduction. The shoulders are virtually flat. Frame #4: The right arm continues to be held in a forward position. The left arm finishes the insweep as adduction of the upper arm is completed. The shoulders continue to remain flat. Frame #5: The right arm continues to be held in a forward position. The left begins to sweep slightly outward as the arm extends at the elbow. The left shoulder elevates in preparation for arm extraction. Frame #6: The right arm continues to be held in the forward position. The left arm is abruptly extracted from the water, before effective extension is achieved. This suggests the stroke is not as long as it could be if it were removed with a more gradual rounding movement, which would also involve a more extensive propulsion time. At this stage, arm propulsion has ceased. The swimmer's forward progression starts to negatively accelerate with the level of acceleration being moderated slightly by an emphasized six-beat kick. Frame #7: No arm propulsion is occurring. A big kick reduces negative acceleration and contributes to the maintenance of a streamlined body position. [It is worth noting the turbulence coming off the swimmer's torso. A SpeedoÒ body suit is being worn and shows no abatement of drag turbulence on the torso. It is even possible that the suit increases the drag.] At this stage, the right arm has remained extended for six-tenths of a second. Frame #8: The right arm begins the repositioning phase of the stroke. Any forces created here are vertical. The vertical arm force and the vertical force created by a kick are used to counterbalance the downward force produced by the recovering left arm. Frame #9: The right arm continues to press downward and the right leg prepares to kick, once again to support the recovering left arm. No arm propulsion has occurred for three-tenths of a second. Frame #10: The right arm bends at the elbow as abduction of the upper arm begins. The forearm would be better positioned if greater medial rotation of the upper arm had occurred. If that happened, the underwater effective pull would be longer. It is hard to determine if the left arm recovers in a sweep to balance the outward moving right arm or if the right arm moves that way because of the left arm recovery. The left arm approaches the entry. Frame #11: The left hand enters the water. The right arm continues to sweep wider as the upper arm rotates in the shoulder joint due to abduction. The right lower arm is positioned better to apply a primarily horizontal force. The shoulders are flat. A stronger position and more direct force application would be achieved if the right shoulder was angled more downward, an action that is prevented because of the left arm being in the water. The left leg executes a large and vigorous kick. Frame #12: The right arm adducts. The whole arm is possibly involved in generating propulsive force. The left arm extends forward. The left leg completes its kick. Frame #13: The right arm continues to produce a backward force as effective adduction is completed. The left arm extends forward. The left leg prepares to execute a large kick by dropping the knee low and momentarily increasing frontal resistance. The shoulders are flat. Frame #14: The right elbow elevates to initiate extraction. The left leg kick is abbreviated possibly because forces produced by the kick and leaning slightly on the left arm are sufficient to counterbalance the forces created by the initiation of the right arm recovery. Frame #15: The right arm has been extracted early ("rounding-out" and more arm extension have not been exploited). The body rolls to the left to assist in the initiation of the right arm recovery. The swimmer increases the lean on the extended left arm. No propulsive arm force exists. Frame #16: Propulsive arm forces are not produced. The left leg prepares to execute a vigorous kick. The right arm continues to recover. Frame #17: The swimmer increases the lean on the left arm (the drag force bubbles on the back of the hand verify this). The left leg continues to flex at the knee before executing a kick. Frame #18: The left arm lean continues and the left hand begins to push outward at the same time. This constitutes the initiation of a repositioning of the left arm to produce propulsive forces. Abduction of the upper left arm also commences. The left knee joint appears to be close to a right angle, which portends a very large kick. The left knee also appears to be dropping outside of the frontal resistance profile (i.e., "body shadow"). Four-tenths of a second has elapsed since an arm did anything that could be construed as repositioning for or developing effective force. Frame #19: The right arm abducts, flexes at the elbow and begins a propulsive force (a small amount of turbulence is coming off the back of the hand and wrist). The potential for abduction and adduction to produce effective propulsion is reduced because in this position, abduction is almost completed. [That means the powerful shoulder muscles that could be used are "wasted" by the movement sequence displayed by this and the left arm pulling-pattern.] The left leg still trails downward as a kick is executed. Frame #20: A position similar to that displayed in Frame #2 is exhibited. There is not much good that can be said about the technique of this stroke. It contravenes appropriate biomechanical laws, physical laws, and principles involved in effective crawl stroke swimming. Despite all the stroke deficiencies, the swimmer did set a new American record in this event. That is testimony to the superior talent and physical abilities of Larsen Jensen. One is set to wondering just how good this athlete would be if he swam more efficiently and effectively. A summary of Larsen Jensen's stroke weaknesses is as follows. The catch-up arm sequencing produces extensive periods of time when no arm propulsion is produced. During the inertial lags of both arms, the swimmer slows. 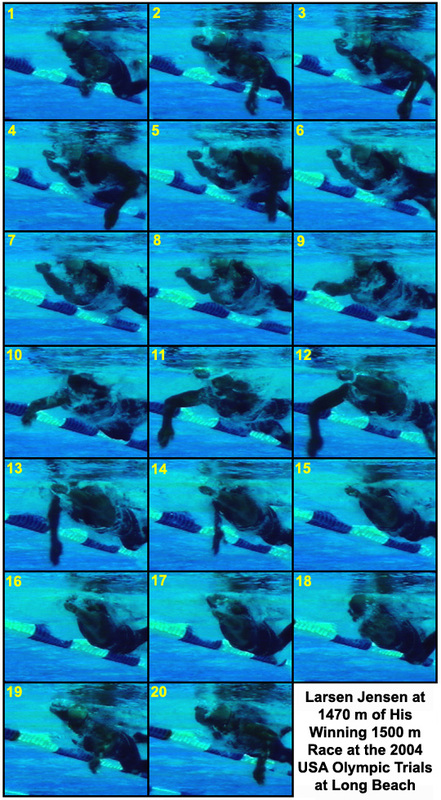 length of the overall underwater effective pull is short because of slow initial repositioning of the forearm/hand propelling surface and the sudden and early termination of backward propulsion. The amount of time consumed in effecting this catch-up arm stroke is longer than one would expect with a more balanced stroke. There is no place for a catch-up stroking pattern in modern swimming (Millet, Chollet, Chalies & Chatard, 2002). As well, a catch up stroke does not produce the highest propelling efficiency, the most important factor in swimming propulsion (D'Acquisto & Berry, 2003). A further concern about Larsen Jensen's stroke is its reliance on big six-beat kicking. Although kicking is not displayed adequately in this sequence of frames, in other pictures it occurs during this race phase. In 1500 m swimming, kicking has to be less than in sprinting in either or both magnitude and duration. It is not possible to determine if the exhibited "slow" stroke rate is caused totally or partly because of the six-beat kicking that dominates the race. Unfortunately, little that is positive can be learned from this analysis. It does show the inefficiencies of a catch-up kick-dominated stroke. The performance potential of this extraordinary athlete is not exploited by this style of swimming. The $1M reward offered by US Swimming to the first American male to break the 1500-m world record is safe. D'Acquisto, L. J., & Berry, J. E. (2003). Relationship between estimated propelling efficiency, peak aerobic power, and swimming performance in trained male swimmers. Medicine and Science in Sports and Exercise, 34(5), Supplement abstract 193 . Millet, G. P., Chollet, D., Chalies, S., & Chatard, J. C. (2002). Coordination in front crawl in elite triathletes and elite swimmers. International Journal of Sports Medicine, 23, 99-104.